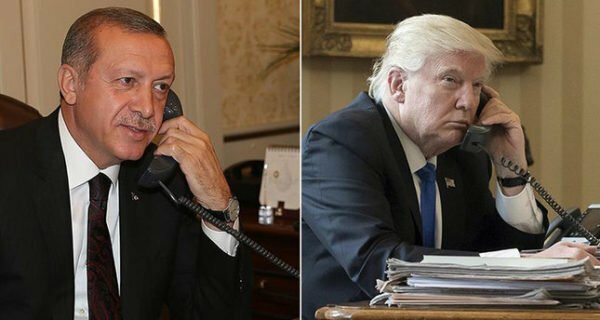 President Donald Trump has congratulated Turkey’s President Recep Tayyip Erdogan on his victory in April 16 referendum that gave him sweeping new powers. President Trump’s phone call contrasts with European concern that the result – 51.4% in favor of the constitutional changes – has exposed deep splits in Turkish society. Recep Tayyip Erdogan has rejected criticism from international monitors who said he had been favored by an “unequal campaign”. Turkey’s main opposition party is launching an appeal to invalidate the result. The constitutional changes – due to be introduced before presidential and parliamentary elections in November 2019 – will turn Turkey into a presidential republic similar to the US and France. This could enable President Recep Tayyip Erdogan to stay in power until 2029. Erdogan’s narrow victory was ruled valid by Turkey’s electoral body, despite claims of irregularities by the opposition. On April 17, Turkey extended the state of emergency for three months. The measure, introduced after a failed coup in July 2016, was set to expire in two days. Syria is one of the issues straining relations between Washington and Ankara. Turkey is irked by the policy started by the Obama administration of supporting Kurdish fighters in Syria who are fighting ISIS. Turkey views the Syrian Kurdish People’s Protection Units (YPG) as a terror group linked to Kurdish separatists waging an insurgency inside the country since 1984. Turkey – a key NATO ally – has established closer co-operation with Russia recently. The two sides are also at loggerheads over Fethullah Gulen. Turkey accuses the Pennsylvania-based cleric of orchestrating the failed coup and wants him extradited. Officially Washington insists any decision on returning Fethullah Gulen to Turkey from the US remains a judicial rather than a political one. President Trump’s comments contrasted with a statement by the US state department which mentioned concerns by international observers and urged Turkey to respect the rights of its citizens – chiming with sentiment in European capitals. German Chancellor Angela Merkel warned that the “tight referendum result shows how deeply divided Turkish society is and that means a big responsibility for the Turkish leadership and for President Erdogan personally”. And the European Commission issued a similar call.